Suitable for ages 4+. Young Children will need the help and supervision of an adult. Lily is the Summer Fairy. She loves flowers and nature and greeting the sun on a bright summer’s morning. ‘Lilypad Gardens’ is the perfect address for Lily and her froggy friend to live. This enchanting flowerpot house has its own moat and draw-bridge. Use the seeds provided to grow grass for a roof-top garden (or plant flowers of your choice) in the top part of the flowerpot, and beneath is Lily’s spacious fairy home. Her home will be even more special if you make her some hand-made furniture from items you can find or recycle. 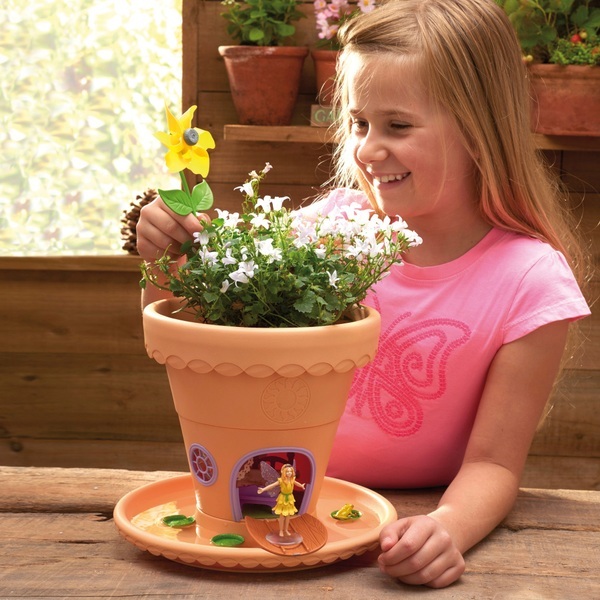 Lilypad Gardens can be used indoors or outdoors and comes complete with the house, a fairy figurine, her frog companion and an activity manual to create a magical scene.